The principle underlying this system is well known: static electricity (i.e., the triboelectrification effect). When two insulators like paper and teflon come into contact, they gain or lose electrons. The system is made up of two small cards, where one side of each card is covered with a graphite carbon layer by penciling. 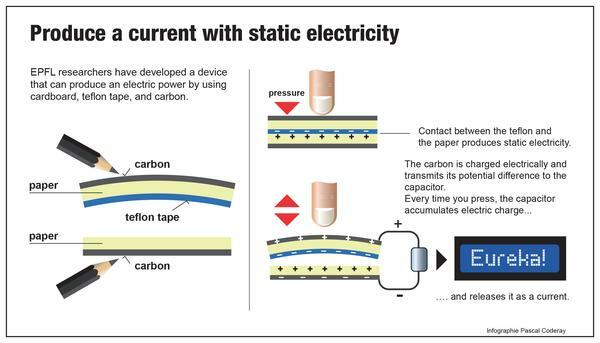 The carbon layers serve as the electrodes. Teflon is then applied to the opposite side of one of the cards. When brought together, they make a sandwich: two layers of carbon on the outside, then two layers of paper and one layer of Teflon attached to one of paper cards. They are then taped together to form the arch-shaped geometry (see the video below for more details), enlarging the output performance. By pressing down with your finger on the system, the two insulators come into contact. This creates charges at the surfaces: positive for the paper; and negative for the Teflon. When you release your finger and the cards separate, the net charges are generated on the carbon layers due to the electrostatic induction. To boost the device’s output, Xiao-Sheng Zhang, a postdoc at EPFL's Microsystems Laboratory and a visiting researcher with the University of Tokyo, used a process of sandpaper imprinting. Pressing the sandpaper firmly against the cards and the Teflon tap gives them a rough surface. This increases the effective triboelectric area, which in turn improves the system’s output more than six times. If you press your finger on the cards, even at a very low rate of 1.5 times per second, the fabricated device can generate enough power to drive micro- or nano- sensors. This type of system is quite promising since it can be constructed with everyday items. Research on the use of static electricity to generate energy, dubbed ‘TENG’ (TriboElectric NanoGenerator), began in 2012. This could have applications in many fields, such as portable electronics and biomedical microsystems. Ultra low-cost sensors made of paper for various diagnostic purposes, which would be especially practical for developing countries, are already being tested. This proposed TENG shows robust output power when pressed by fingers demonstrating its use as energy harvester based on low-cost, commodity materials such as paper, Teflon and graphite. This paper system could represent the next step, since it would remove the need for conventional batteries does not generate waste.